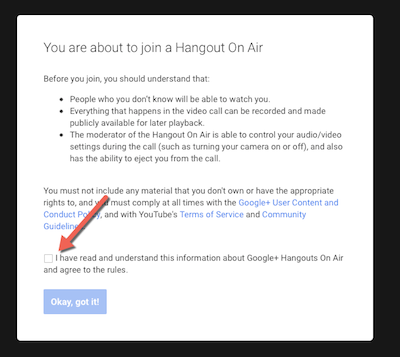 Hangout Queen — Taking Your Google Hangouts (and presentations) to the Next Level! Here are some opinions of Blab. Realizing Blab is gone, it is interesting to see what these two ladies have to say about it, and its former existence. You can also watch Ileane Smith’s opinion of Blab. She was a power user and she has some interesting insights. Joining a hangout is fairly simple, but there are just a couple of caveats worth noting. Here are some screenshots to help you through the process, visually. Before the “join” button is available for you to click, you need to read the Google agreement (or at least indicate that you have done so ). At the bottom of the agreement is a checkbox that you need to check to indicate that you have read it. After you check the box, the “join” button will appear clickable for you. Depending on your device (i.e. computer, laptop, smart phone, tablet, etc. ), it may be difficult to see the checkbox. It helps that you know that it exists and scroll down until you see it. In some cases (especially laptops that have been zoomed in (i.e. 200%), it may be difficult to get it to show up on the screen. In those cases, you need to zoom out so that you can get to the checkbox. Sidebar: In one case, with my Macbook Air, I couldn’t get to what I needed and I actually had to use “Air Display” (part of the Mac OS) to send my monitor feed (display) to the wi-fi enabled TV so that I could get to the button. Fortunately, that is not the case with the Google Hangout. I only share that to let you know that if you are having trouble, you are not alone and likely there is a creative solution. After you have clicked past the agreement, you will have the final join screen. This screen allows you to see who the host is (at the top). In this case, this image shows the host as SocialWebCafe. Your profile pic will show at the bottom, in a smaller image (allowing you to notice if you have accidentally logged in as a page or someone else has logged in on your computer). There is a notation of whether you are connected, as far as Google circle. I have set it up so that you could see that “we” (me and myself lol) are not connected. This actually doesn’t matter. It is ideal (so that you can properly communicate on Google Plus), but it is not essential. It is more of a suggestion than a requirement. P.S. It isn’t shown in the image, but if you want to join in a muted state or even with your camera off, you can actually do that by click on the buttons at the top of the screen before hitting join. Your quick tip today is about those comments on the Google Hangout Event Page. There are different ways to handle comments. First, let’s identify three of the places where you may find, or allow, comments. 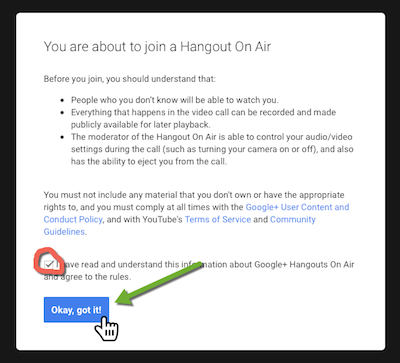 How To Understand the Google Hangout Event Page Better Than Its Designer! Now that you have learned how to start a hangout, you are ready to go through the steps, again, and take a deeper look at the Hangout Event Page. 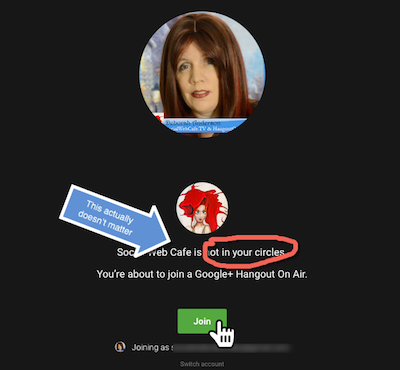 At first glance, the event page for a Google Hangout can appear confusing. But, it doesn’t need to be, if you break down the event page into sections. The easiest portion of the page is the part that is similar to the rest of Google Plus, and that is the comment section where you can add comments and answer questions from your attendees. It is located in the lower left and you can comment before the event, during the event and even after the event. To start the hangout: https://plus.google.com/hangouts.